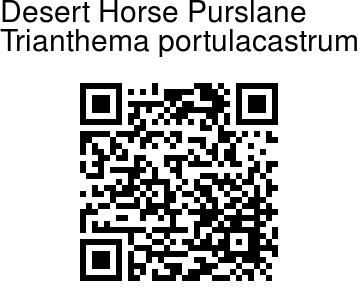 Desert Horse Purslane is a weed found throughout the tropical and subtropical countries. 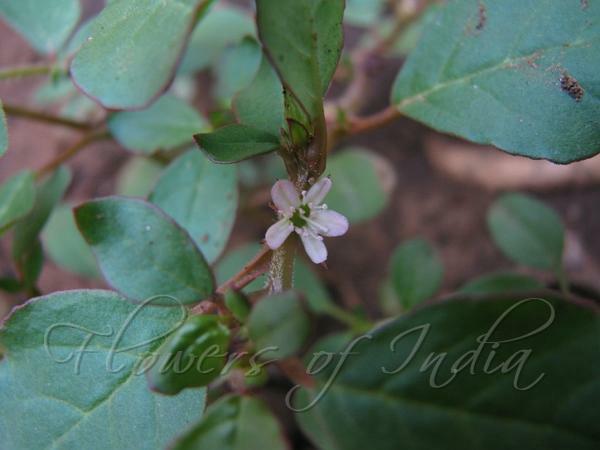 It occurs in wastelands, roadsides, lawns, gardens, cultivated crops, and in paddy fields if the water supply is low. Stems are prostrate or rising, somewhat succulent, up to 50 cm long or more, smooth or sparsely velvety. Leaves are flat, elliptic to obovate or spade-shaped, 1-2 cm long, 0.4-2 cm wide, margins entire, tip blunt, base rounded to wedge-shaped. Leaf stalks are 0.5-2.5 cm long, expanded into a sheath joined with opposing leaf base to form a cup. Pink flowers are borne solitary, stalkless, largely hidden in leaf axils. Petals (perianth lobes) are linear to narrowly deltate, 4-5 mm long, inner surface pink or white, sparsely velvety externally; ovary cylindrical; style about 2 mm long.